Somewhere in the Lot Valley. I have to admit it is pretty hot out here, they are having their ‘second summer’. 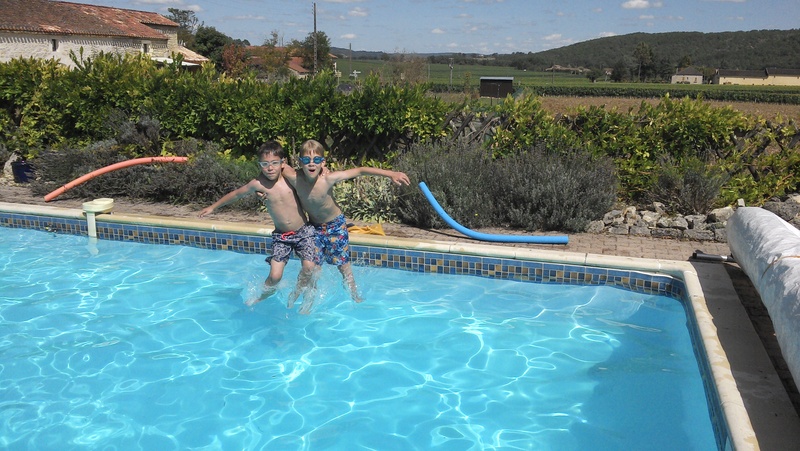 A lot of time is spent in the swimming pool. We have a special ‘ageing hippie’ who looks after the pool, here he is doing a spot of fishing / cleaning…..
…. 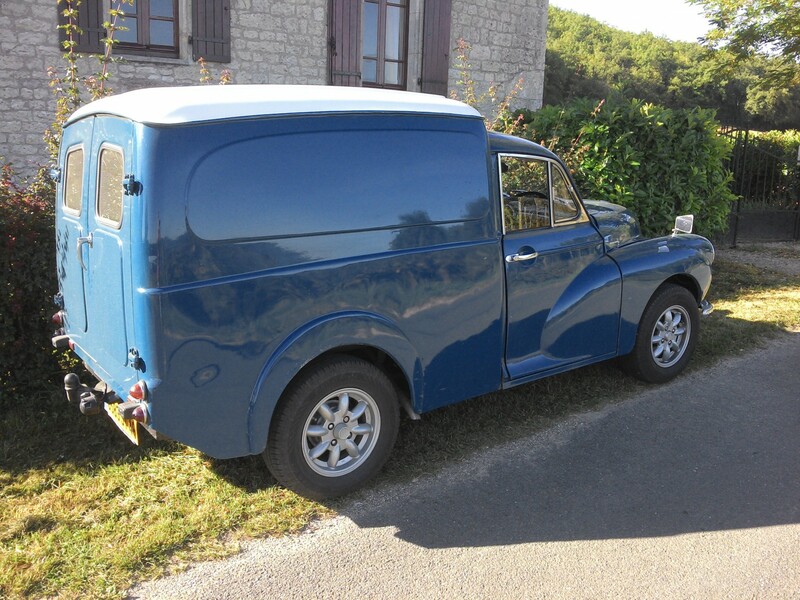 he turns up in a splendid Morris Minor van. 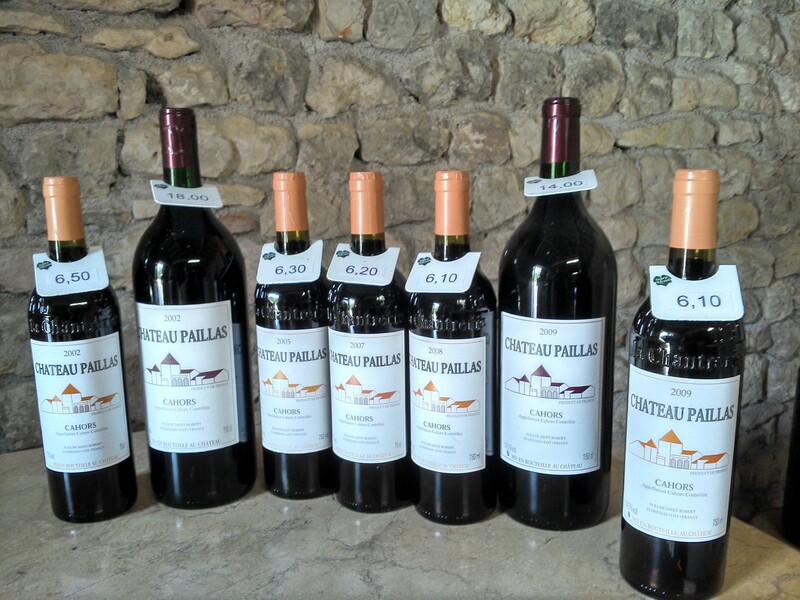 An afternoon’s visit to a vineyard has been arranged – Château Paillas. 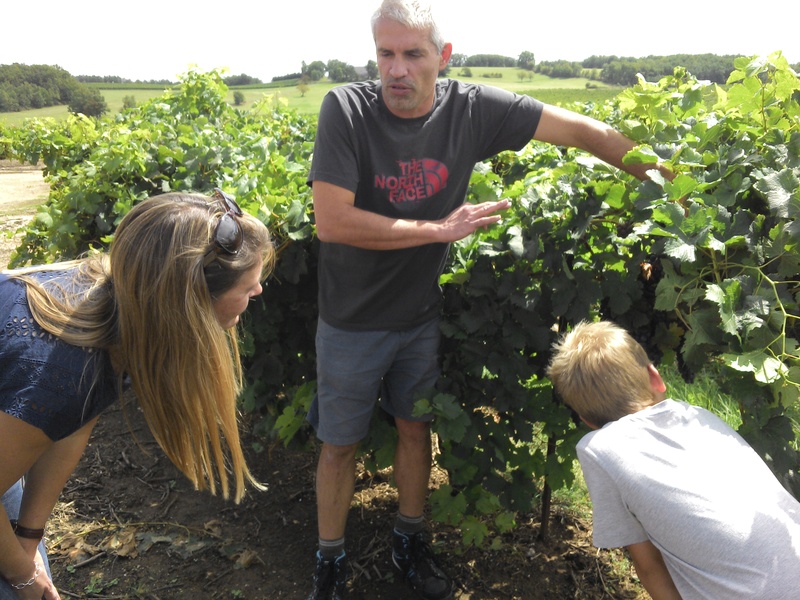 A friend imports their Cahors wine into England. Cahors wine is deep red, some say almost black, made from at least 70% Malbec mixed with Merlot and a little Tannat. The wines are given an AOC, [Appellation d’origine contrôlée]. We started off with a visit to the growing vines to view the ripening grapes and see the difference between Malbec and Merlot stock. [They use 90 % Malbec here.] The ground is shallow clay and limestone. Our guide talked of the problems with fungi, cold and not enough sunshine. each year is different and a challenge to produce quality wine. 2013 was a poor year and the produce is not even being marketed as AOC Cahors. Mechanisation has transformed viticulture, lots of hands are needed for pruning but not for spraying or harvesting. Inside the buildings we saw the huge shaking machine used for harvesting. Crushing and filtering are automatic. 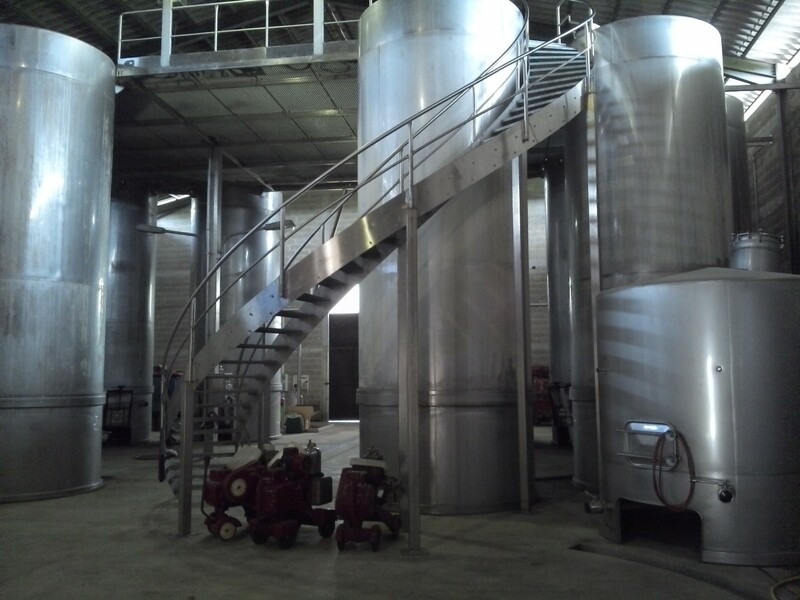 The stainless steel fermentation and maturing tanks were almost artistic in themselves. A brave new world. Regular testing and blending are crucial to a good vintage. Finally we tasted a few sample years and there certainly was a significant difference between them, but at the end of the day it comes down to personal preference. Mine’s a large glass of this lovely dark, rich wine with smooth tannins. This turned out to be a most enjoyable and informative afternoon. 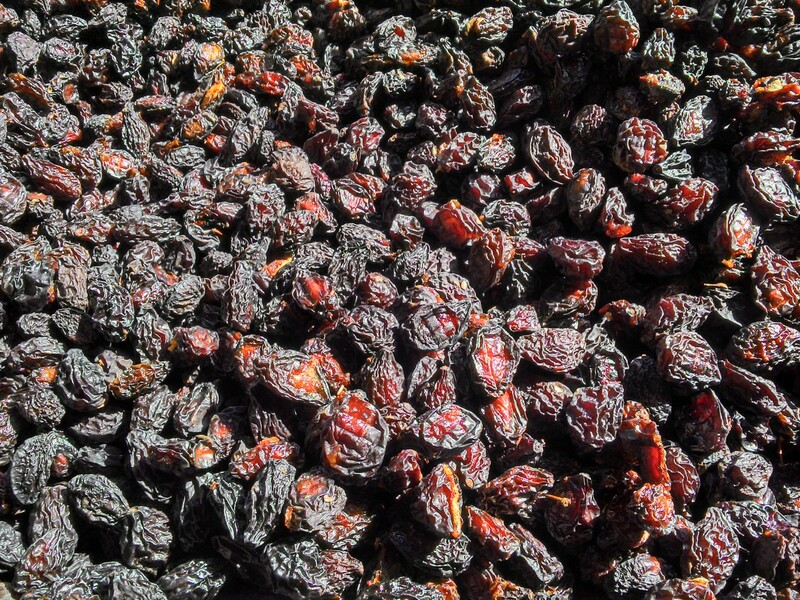 Another product of the Lot area is prunes. Plum trees are a common sight and several wineries grow them as a bi-product. This is the case at the nearby Chateau de Hauterive run by the friendly Filhol family. Now is the plum harvesting time, grapes are at the end of September. 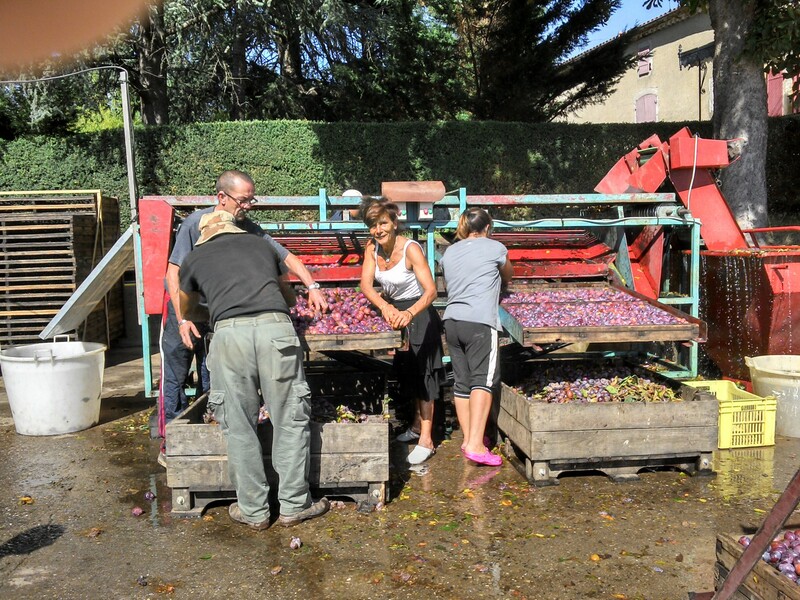 So on our visit to the chateau to taste and purchase supplies we saw the plums being sorted, washed and then dried in large ovens to produce the familiar prune. To avoid confusion in French a plum is a prune and a prune is a pruneau! The Filhols market jars of prunes in wine which are delicious with ice cream. Don’t mention the aquavit pruneau. Time to head back to the pool. 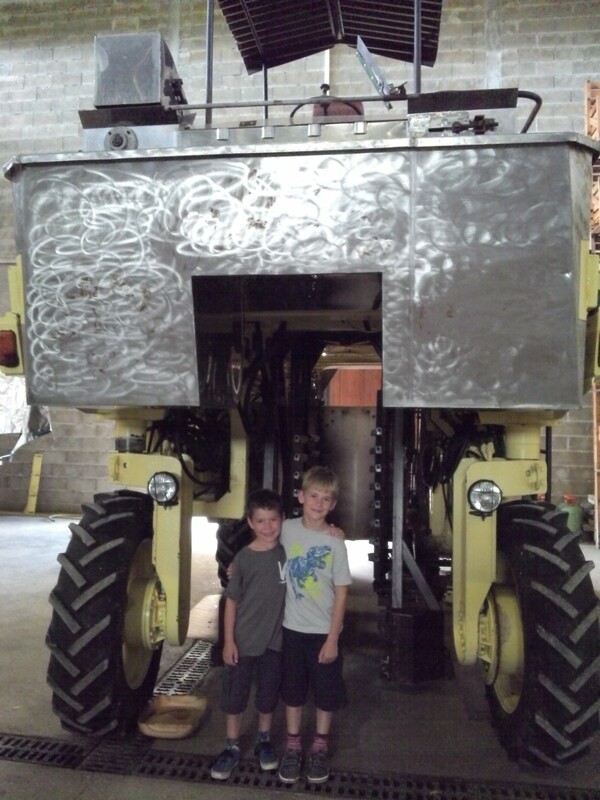 This entry was posted in France and tagged France, The Lot on September 6, 2014 by bowlandclimber. Even though I am enjoying the delights of the SWCoast Path at the mo you are making me envious.